After years working at studios like Jungle, Trident, and Bubble among others, I learnt the insights of professional audio recording. Now I can offer that same professional audio quality to my clients recording from my own studio saving time, money and unnecessary headaches. 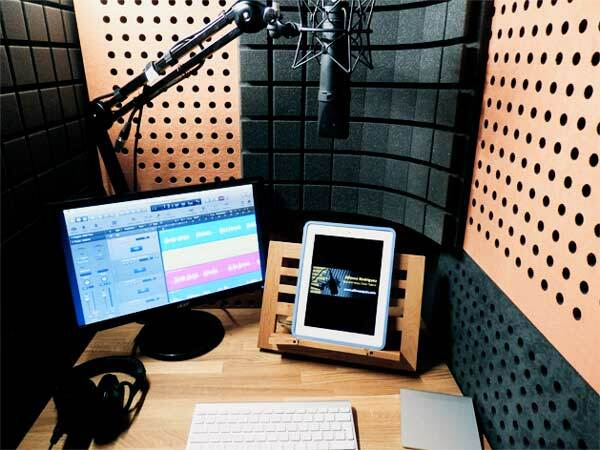 In addition, thanks to Source Connect any studio can record remotely with just a click, and if clients want to monitor and direct the session, they can do it via Skype. Home studio recording services have increased lately, that’s why high quality standards are paramount for Alfonso and his clients. Alfonso guarantees the best audio quality available today saving time and money. Alfonso’s passion and professionalism give clients the peace of mind they need when Alfonso voices their projects. The studio is equipped with Source Connect software for remote recording just like ISDN. Clients can also monitor the session live via Skype. In addition, Alfonso can record to picture and deliver a perfectly synchronised audio file in the required format. After the recording session you will have a same day delivery of the edited takes in MP3, WAVE, or AIFF format via Alfonso’s private FTP site. The studio includes: Studiobricks booth, Neumann U87 & Rode K2 microphones, Avalon M5 preamp, Apogee Duet interface, Mac computers.